Why is wisdom personified as a woman in the book of Proverbs? An essay. My work here is complete, got this comment on an essay: "I cannot remember an essay before which included both the Matrix and Lysistrata"
So, in response to people’s requests here it is in full below. Describe and evaluate the significance of the female personification of wisdom in Proverbs. 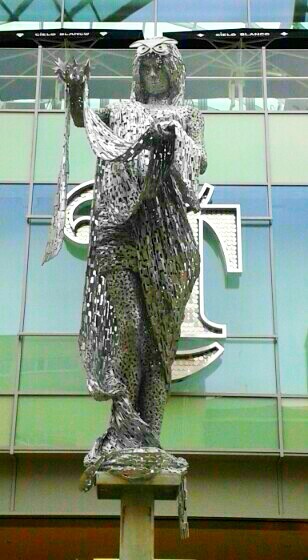 The Briggate Minerva – statue at the new Trinity Centre, Leeds. Minerva is the goddess of wisdom. A related sermon I preached on Proverbs 31 is here.